Another year, another season of Syracuse finishing as a middling seed in the ACC tournament trying to reach 20 wins on the season. Without a doubt, the Orange continues to struggle with the depth and talent of the conference. Don’t believe me? SU dropped six of the final nine regular season games of the year. It’s not the first time Jim Boeheim’s crew has seemed to hit a wall down the stretch. Each of the last two seasons, Syracuse lost four of six to close the regular season. The Orange dropped four of five heading into the Final Four run of 2016. 2015 featured a 4-8 record in the final stretch, including dropping the final three. SU also finished 2-4 in 2014, the first season for the team in the ACC. On top of all of that, 2018 was the first time Syracuse won a game in the ACC tournament. Needless to say, this team has limped to the finish consistently since leaving the Big East. Some of that is due to the depth of the league (there is no question the bottom teams in the ACC posed greater challenges than Rutgers, USF or DePaul most seasons), but part of it is Syracuse’s inability to adjust to keep up with the elite teams in the conference, both on the court and on the recruiting trail. Since joining the ACC, Syracuse is a combined 7-20 against the trio of Duke, Virginia and North Carolina. The Orange has had some success facing the Blue Devils (4-6), but mustered just one win vs. UNC and a pair over UVA. While the Big East was chock full of good teams, none of them quite measure up to the might of these three. Over the past five seasons, Duke, North Carolina and Virginia have amassed nine top-seeds in the tournament, three national title game appearances and two championships. Keep in mind Virginia is in the Final Four and could very well add to those totals. A lot of the issues on the court have to do with an inability to keep up in recruiting. Now this isn’t just about where teams rank in recruiting, its about filling out your roster with player that fit the system and approach. For Duke, it has fully embraced the one-and-done types, ranking top of the conference and usually the nation in recruiting, bringing in talented players ready to play right away and excel. That has never been Boeheim’s style, he fits more in line with what Roy Williams and Tony Bennett tend to do. Williams will sign a big-time freshman every now and then to supplement an experienced group. From 2014 to 2018, North Carolina ranked as high as second and as low as ninth in the conference in terms of recruiting according to 24/7 Sports. In 2014, UNC added Theo Pinson, Joel Berry and Justin Jackson. They were all 5-star recruits, but stayed in school at least 3 years. The following year was much less heralded with Kenny Williams and Luke Maye joining, but it is clear that four years later, their impact has been felt in North Carolina. 2016 saw a one-and-done in Tony Bradley, but Seventh Woods remains a contributor off the bench three years later. Last year featured Garrison Brooks and Sterling Manley as strong depth players. This year Williams landed two 5-star phenoms to bolster the team in Nassir Little and Coby White. Virginia often recruits under-the-radar prospects, with Bennett opting to sign players that fit his defensive scheme. 2014 did not provide a ton of returns for the Cavaliers. B.J. Stith transferred after just one season to Old Dominion. Isaiah Wilkins played 4 years, mostly as a defensive contributor. Jack Salt is still around as a fifth-year senior. Mamadi Diakite was the lone 2015 recruit and etched himself into UVA history with his buzzer-beater to force overtime in the Elite Eight. 2016 saw Bennett hit the motherload, landing Kyle Guy, Ty Jerome and De’Andre Hunter. Those are three of the best players in program history. 2017’s class of Marco Anthony and Francesco Badocchi have yet to make an impact. Neither has the 2018 class outside of Kihei Clark. That seems to be how Bennett wants it. He tends to develop players in his system for a year or two before unleashing them on the conference. Boeheim tends to fall somewhere in between the two in terms of his style. He is unafraid of landing a top-tier prospect to bolster his squad, but also recruits to fit his system. However, the results have been a bit underwhelming in recent years. In 2014, Syracuse added Kaleb Joseph and Chris McCullough. Joseph transferred following his sophomore year and McCullough left after one season for the NBA after he tore his ACL. 2015 proved to be much more fruitful, with future NBA players Tyler Lydon and Malachi Richardson to go along with Frank Howard, who had an up-and-down four years at SU. Lydon left after two seasons, and Richardson left after his freshman year. The following year, 2016, proved to be a mixed bag. Syracuse got one season each out of Taurean Thompson and Matt Moyer before they transferred (technically Moyer had two, but he redshirted his first year). Tyus Battle proved to be the gem of that class, though he never turned into the NBA prospect that many had hoped he’d be. It’s unclear where Syracuse’s 2017 class will land. 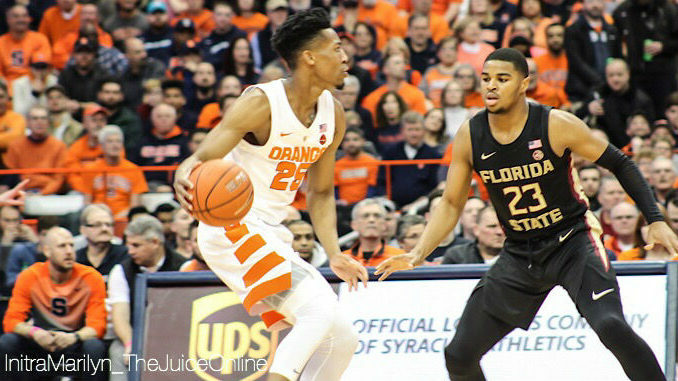 They’ve gotten underwhelming performances from Howard Washington (between injury and lack of development, he fell out the picture this season) and Bourama Sidibe, but they’ve also found diamonds in the rough in the form of Oshae Brissett and Marek Dolezaj. Losing Darius Bazley in the 2018 class cost SU the elite recruit they’ve missed out on over the last few years (Jordan Tucker, Quade Greene, Isaiah Stewart, to name a few), and only Buddy Boeheim played consistently of a class that also included top 50 recruit Jalen Carey and Robert Braswell. It might be a high bar to set for judging Syracuse’s success, but when you consider the program Boeheim built before moving to the ACC, it seems reasonable. Joining that tier of blue bloods reigning supreme over the conference has to be the goal for the Orange.